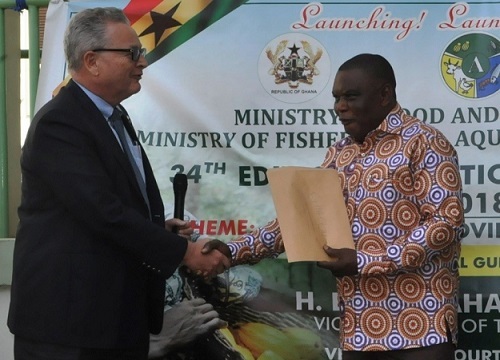 The Managing Director of Ghacem, Mr. Morten Gade, has underscored agriculture as the backbone of Ghana’s economy and is therefore appealing to government and stakeholders to join hands and ensure its success. “Today, Agriculture represents 18% of GDP in Ghana – which is far too low for ensuring that the Agricultural sector remains the main employer of the people of Ghana,” he bemoaned. Mr. Gade was speaking in an interview with the media after handing over 1000 bags of cement on behalf of Ghacem to the organising committee of this year’s 34th National Farmer’s Day celebration. The Managing Director, Mr. Morten Gade, presented the Ghacem donation to Dr. Gyiele Nurah, Minister of State for Agriculture. Also present was Mr.Kennedy Osei Nyarko, Deputy Minister of Agriculture in charge of perennial crops. Mr. Gade observed the celebration’s theme, ‘Agriculture, moving Ghana’s beyond aid’. “Ghacem is ready to support government in this direction,” he assured. He seized the occasion to to inform of the company’s flagship CSR programme – ‘the Ghacem Cement Foundation’ which continues to provide for cement for infrastructural development of deprived schools and hospitals, and has since its inception invested Ghc 16 million. On his part, Dr. Gyiele Nurah thanked Ghacem for its consistency in supporting the annual Farme’s Day celebration. He informed that this year’s celebration will be held in tamale, and therefore appealed for corporate institutions to come early with their various support items to ensure smooth preparation of the event.